It's 2017 and there has just been a General Election in the UK. In case you're reading this in the future, I'm talking about the first General Election of 2017. 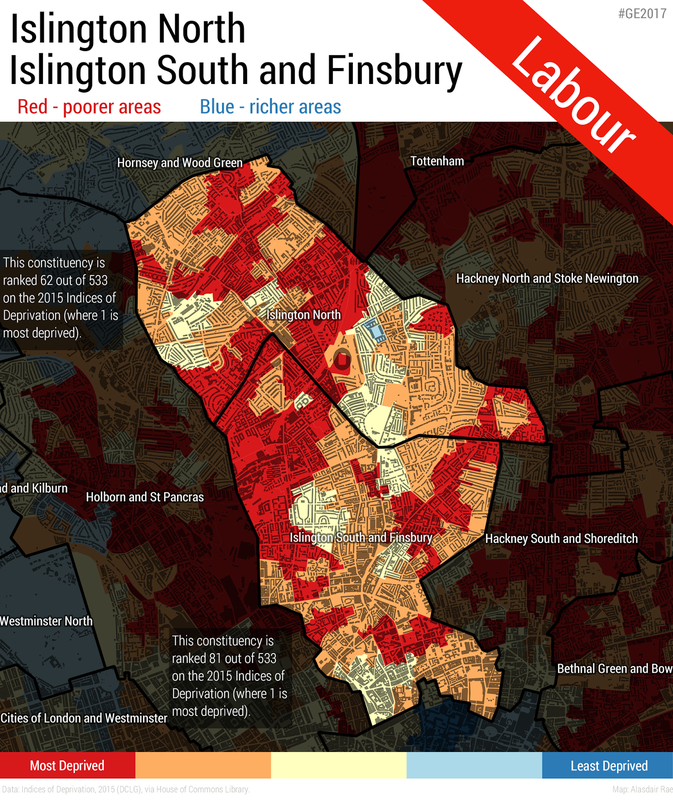 Today's post is a brief comment, plus a few maps, starting with one on the Labour win in Kensington in London. To summarise briefly: Labour won a seat that many people thought they couldn't, and won by 20 votes with Emma Dent Coad becoming the new MP in a gain from the Conservatives. But this is an immensely wealthy area, isn't it? Yes and no. There is a lot of money here but also a good deal of poverty, as you can see from the map below, where the red areas are among the 20% most deprived in England. As with most things, however, it's not a simple story and the result is perhaps not that shocking when you look at the map, even if some have named it the 'UK's richest constituency' (and there is an argument for that view). It's also definitely not 'London's Richest District', as one report puts it. Some numbers, to help put things in context... 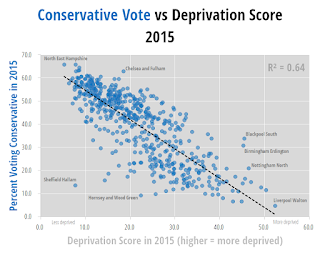 If we rank the 533 English constituencies by deprivation, using the Indices of Deprivation 2015 measure calculated by the House of Commons Library, the Kensington constituency ranks 178 out of 533 - just on the edge of the most deprived third in all of England. One look at the map tells us that within the area there is considerable variation, with some parts much more deprived than the national average and some parts less so. In total, 22 of Kensington's small areas (LSOAs) are in the 20% most deprived in England - and none are in the 20% least deprived. The picture is very similar if you look at other indicators, particularly those related to income. However, in London and beyond, the name 'Kensington' has it seems become synonymous with wealth, opulence and 'the elite'. 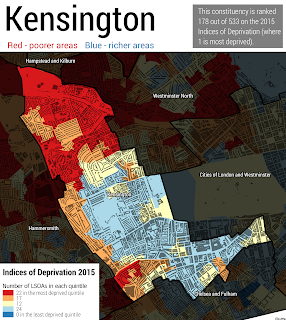 This may be part of the Kensington story, but it's by no means the full story. I just wanted to take a closer look at what the data say in order to figure out if this is really such a surprise. As I did so, I also homed in on a few other constituencies. 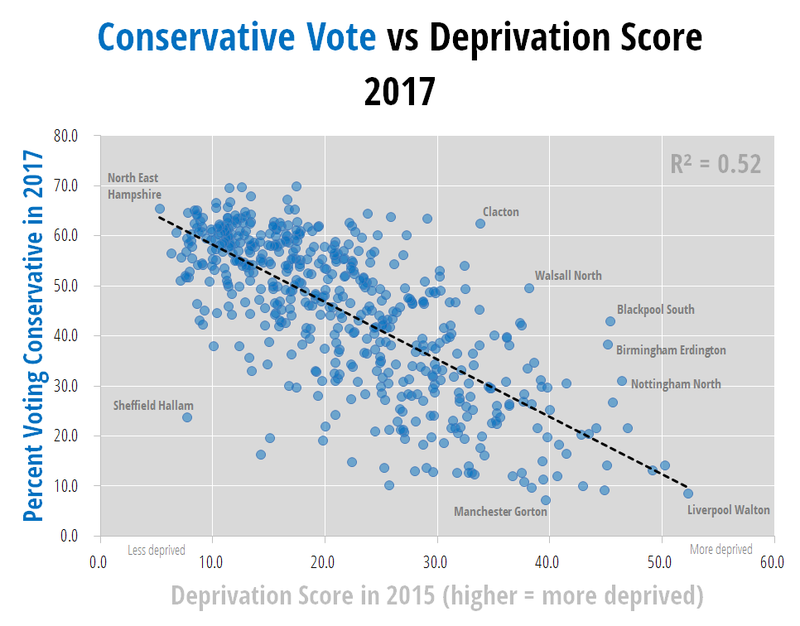 In addition, I attempted to look at the correlation between Conservative vote share and level of deprivation by constituency. I did this for 2015 and 2017 and although the results are not that surprising - i.e. 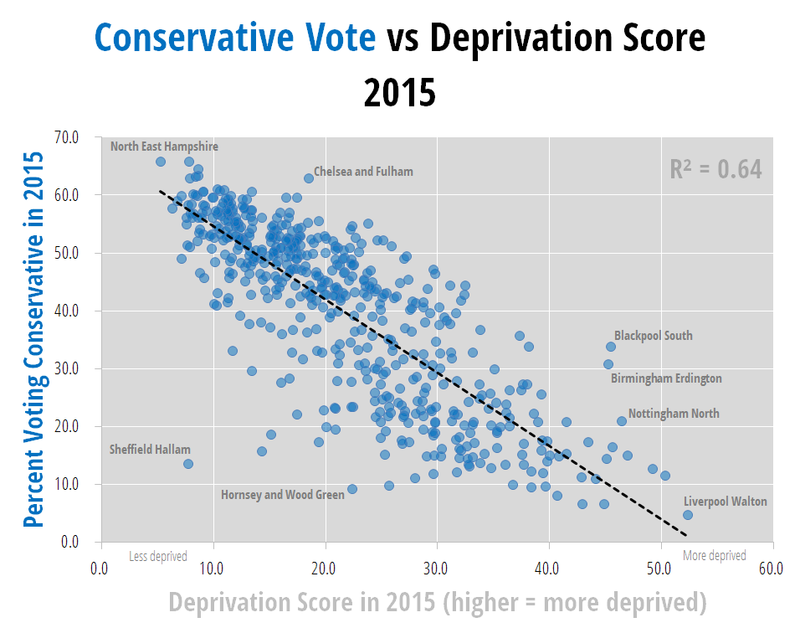 the more deprived an areas is, the lower the Tory vote - some of the outliers are quite interesting. Here are the two charts - below. I've labelled some of the interesting ones as you can see below. 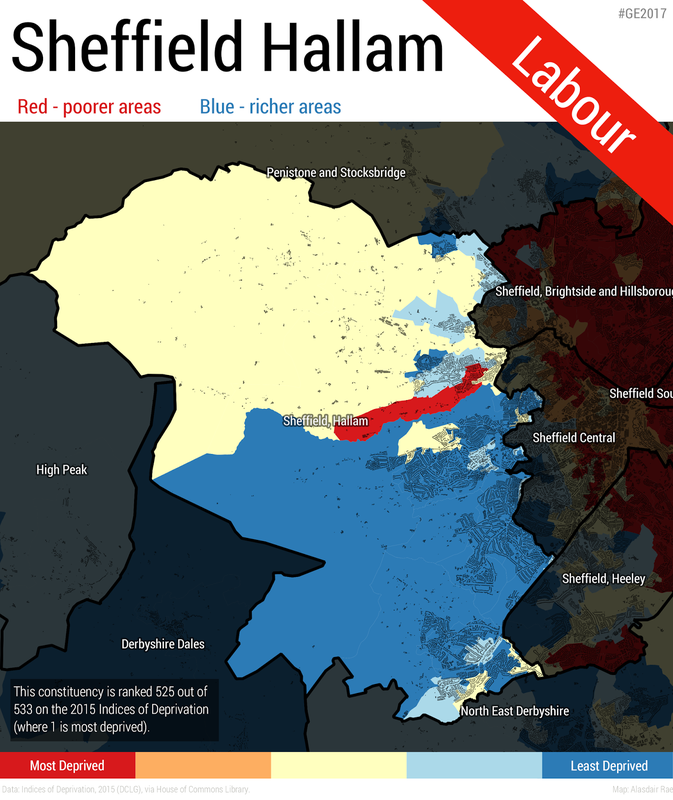 Let's take a look at Sheffield Hallam because it's such an outlier - and also I live in Sheffield (but not there). It was Nick Clegg's constituency but is now Labour (Jared O'Mara MP). 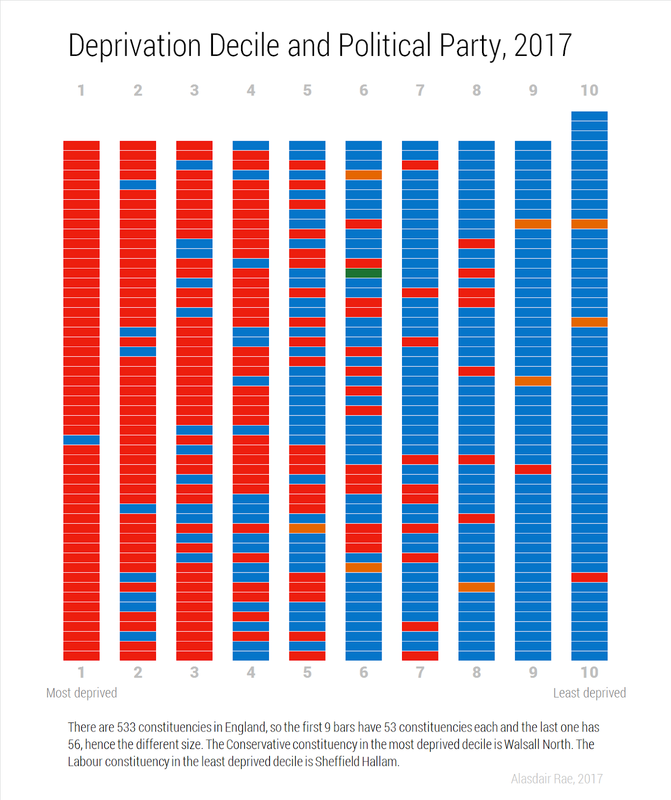 It's also the 9th least deprived constituency in England so is something of an anomaly, though of course not so much when you look at voting history and demographics. 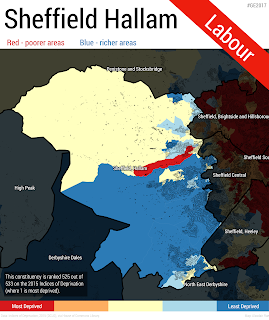 Still, the map is interesting in itself - it bucks the general pattern of the least deprived areas voting Conservative. I then wanted to look at a couple of other places to see what things looked like on the ground. First up is Islington North (Jeremy Corbyn MP) and Islington South and Finsbury (Emily Thornberry MP). Note the little patch of blue around Highbury in an otherwise quite deprived area. This also contrasts with stereotypes of Islington as some kind of land of milk and honey. There is considerable wealth here but it sits beside large areas of deprivation. 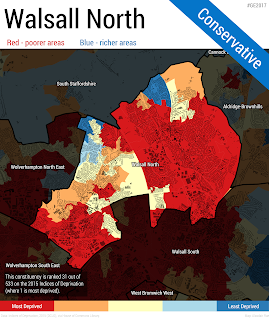 Then I looked at the most deprived Conservative-voting constituency. This is currently Walsall North, which is ranked 31 out of 533 constituencies on the deprivation measure. Again, there are local and historic explanations for this but I don't want to dwell on those now. Last of all, I wanted to look at a constituency where a Labour win truly would be a shock - for this, I looked at the least deprived constituency in all of England: North East Hampshire. When Labour win here I think we can all agree that it would be a shock, just as if the Conservatives won Walton in Liverpool (85.7% Labour, 8.6% Conservative in 2017). Actually, the latter might just be the biggest shock in the history of the world. Mind you, these days you never know what's going to happen next. The Conservatives got 65.5% of the vote here. 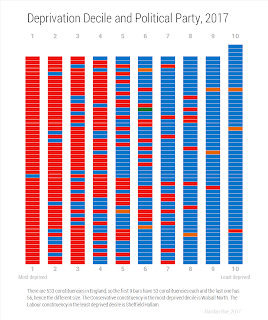 Addendum: I saw a great histogram by Owen Boswarva looking at party by median age in each constituency so I attempted something vaguely similar for deprivation deciles and party. It's not at all surprising but I did find it interesting so am posting it here too. 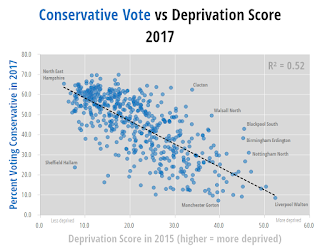 Notes: I do know, of course, that there will always be a strong linear relationship between deprivation and % voting Tory - or Labour for that matter. The point here is that because this is true, and because Kensington is actually quite deprived, the result there is less of a shock than some are claiming. Also, ranking deprivation at the scale of constituencies masks lots of underlying variation - but that's partly why I mapped it at LSOA. If we had LSOA General Election results that would be interesting. The scatterplots were interesting to me not because of the obvious linearity but because a) the relationship changed a good bit between 2015 and 2017 (UKIP effect?) and b) the big residuals - e.g. 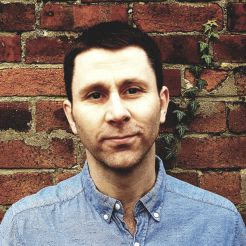 Sheffield Hallam. The ones which defy the general pattern are the ones I'm interested in. Basically, Kensington is right on the trend line and maybe it's because many more people from the deprived parts of Kensington voted this time - plus rich remainers. Finally, a lack of deprivation is not the same as affluence but on any measure you'll find they correlate strongly.